In the 18th century certain dogmatic conceptions began to be questioned. Researchers had to maintain a delicate balance. The consequences of calling into question orthodox doctrine in an authoritarian society could be dire. Linnaeus grew up in a clerical home. He had religious convictions and had to balance his view of nature against these beliefs. He pointed out the similarity of humans to apes and places humans in the system of the animal kingdom, but he nevertheless avoided calling into question the biblical story of creation. In his travels he encountered a great many folk beliefs. From these folk beliefs he would extract whatever met the requirement of being such well-tested experience that it could be put to use. 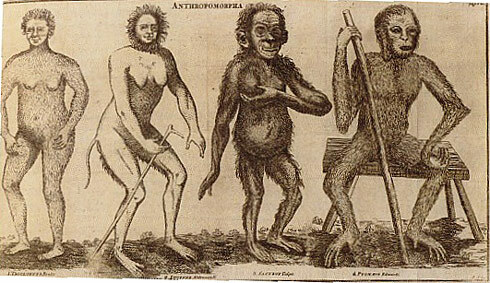 Linnaeus classified humans as Homo Sapiens. The continuity with the animal kingdom is evident.